DO YOU WANT TO CREATE MORE BLISS IN YOUR LIFE? ARE YOU READY TO EMBRACE A LIFE OF FULFILMENT? 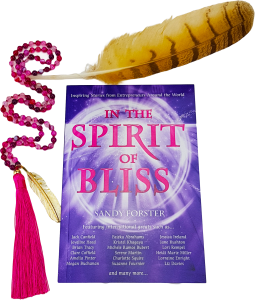 If you answered yes… In the Spirit of Bliss is a must read to inspire, empower and support your own personal transformation to a life that flows with ease and grace. You’ll find inspiring stories from some of the world’s most successful entrepreneurs motivational leaders, success mentors and coaches, as you learn how they pushed through their challenges and overcome odds to experience success beyond their wild imaginings. The secret to following your bliss.. and much more! Discover why business leaders, teachers, speakers, mentors, coaches and trainers in this amazing book have appeared around the world on shows including Oprah, The Tonight Show, Good Morning America and Sunrise Australia. You’ll enjoy stories from some of the world’s leading experts in the field of motivation and success thinking including Oprah Winfrey, Mark Victor Hansen, Sandy Forster, Arielle Ford and Brian Tracy. You’ll discover dozens of stories to inspire you to live your best life and experience bliss now!